Lately I've been getting into the hardboiled detective genre which is something I've never tried before. I was on a Arsene Lupin kick for a while which in a round about way led to an interest in Nick Carter. I mean the real Nick Carter, the detective, not the so called "Killmaster". The thing is, it's really hard to find any original Nick Carter. There's like two stories on the net and the rest are expensive buys from collectors. I'm surprized those original stories haven't ever been reprinted. Anyway that search left me wondering about other pulpy detective types. I'd never read any Chandler or Hammett and decided to pick up some short stories of each. I started with Hammett and read several Continental Op stories. This is the detective that Hammett created before Sam Spade. These are gritty and nihlistic, sometimes hitting the psychotic tone of Norvel Page's THE SPIDER yarns. I was impressed. Then I read some of Raymond Chandler's Philip Marlowe shorts and found it quite entertaining but maybe not as edgy as Hammett. I'll keep reading some of both authors for a while. The short stories go down easy. I decided to put a longer Hammett piece up to listen to during the commute. 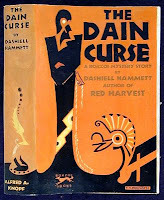 THE DAIN CURSE which is comprised of 4 short stories published in BLACK MASK Magazine from 1928 - 1929. Since this blog tends to deal with the outre I felt this was a pretty good example of the detective genre crossing into the weird tale. As it may sound from the title, this deals with magic, curses, drugs and human sacrifice amongst the normal twists and turns you might find in the hardboiled detective genre. While Philip Marlowe has had quite a movie presence, the Continental Op has only had a few excursions to Hollywood. The first was a TV miniseries in 1978 that very faithfully adapted THE DAIN CURSE. In 1995 the HBO series FALLEN ANGELS adapted "Fly Paper" and in 2002 "The House In Turk Street" (AKA THE GOOD DEED) was made into a movie with Samuel L. Jackson.